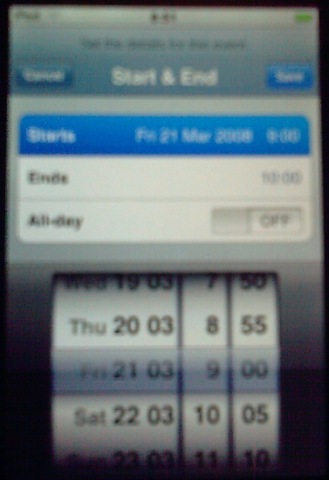 When the iPhone first came out and everyone was raving about its user interface I had to agree with them, despite being a long-term Windows Mobile user. 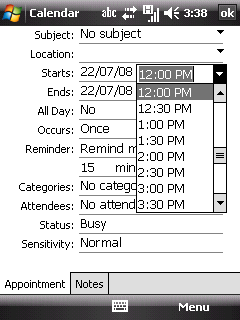 Of course, like all new user interfaces there are always going to be some learning points but on the whole there is a lot to be said for an interface that was solely developed for the use with a finger. 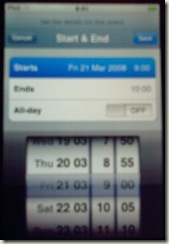 Take the following screenshot, which is actually of an iTouch but could easily be an iPhone, you can see that at the bottom of the screen shot is a set of rollers. 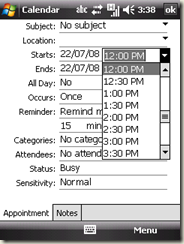 These are used to set the date and time that an appointment is to start. By flicking your finger across the rollers you can wind the date/time forward/backward at different speeds depending on how quickly you move your finger. 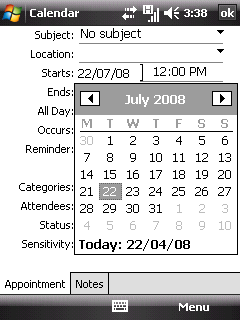 The clear advantage of this interface over the traditional date/time pickers used by the new appointment dialog on Windows Mobile (see below). 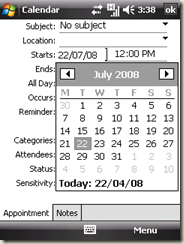 In fact the Windows Mobile interface is so bad (actually perhaps old is a better term of it) that you can't reasonably use it with a finger, you really do need to either use a stylus or if you've worked out how, the d-pad. The current guidance from Microsoft for new Windows Mobile applications is to build for the smartphone (ie no-touch) with the assumption that this is the canonical set of the controls available for both platforms. Unfortunately this is probably the worst thing you can do for a usable touch interface. In my opinion if you want to build an awesome application for the Pocket PC (ie Windows Mobile 6 Classic or Professional - urge why do we still have such silly sku names!) you should be focused on a "touch first design".